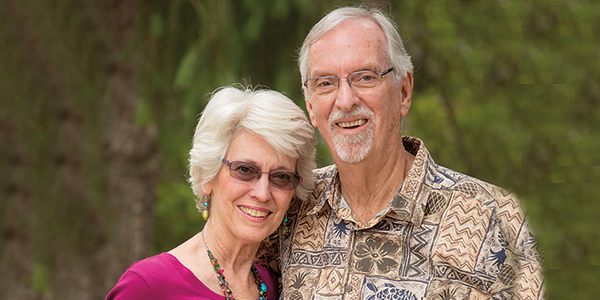 Drawn to both teaching and ministry, Pastor Dave Glass '66 has devoted his life to youth and Christian education, serving churches in Washington and California. He retired as pastor of education and outreach at First Baptist Church of Lodi to start teaching at a local Christian high school before returning to the church part time as visitation pastor. He has also taught church history to pastors in Russia, the Philippines and Tanzania. His degrees reflect his dual interests: Master of Religious Education and Doctor of Education. Dave's wife, Chris, discovered nursing when she worked at a hospital. After their two children started school, she earned a nursing degree and worked part time. She later turned to teaching health at public high schools and completed a credential. She still subs, which gives her time to enjoy their four grandsons and assist Dave in his visitation ministry. Senior class vice president and a student council member at Westmont, Dave values his college studies and experiences. He watched helplessly as Catherwood burned in the 1964 Coyote Fire, but he assisted in saving a neighboring home. Committed to education and grateful for the organizations that shaped their lives, Dave and Chris have divided their estate three ways: one-third for each of their two children and one-third for the Lord's work. They split the latter equally among Westmont, the Conservative Baptist Foreign Mission Society and an organization that sends Christian professionals to China. "It's gratifying to see people grow in their faith, reach out and do great things for the Lord," Dave says. Reproduced with permission from the spring 2016 issue of the Toward Tomorrow newsletter. For more information about how to include Westmont in your will or trust, please contact the Office of Gift Planning at (805) 565-6058 or giftplanning@westmont.edu.